Andre Villas-Boas’ unforgettable tenure in England highlights the various components required to succeed at the highest level. In a country where the media and football fans are quick to criticize, coping with pressure and negativity is a necessity. Winning the treble with a remarkable Porto side transformed Villas-Boas into one of the games most coveted managers in 2011, and with the Chelsea job vacant, the Portuguese manager couldn’t resist. Villas-Boas’ return to Stamford Bridge – he was previously a video analyst for the club – presented an opportunity to replicate Jose Mourinho’s career path and succeed in England. But apart from their nationality, time as work colleagues, and the fact that neither man played professional football, the two managers have very little in common – and Villas-Boas’ spell in the Premier League displayed that. The 36-year-old is a young, vibrant manager that strives on producing attacking football. However, Villas-Boas’ man-management skills were poor, while his obstinacy and tactical naivety led to his downfall. The Portuguese manager’s attempt to play ‘vertical football’ – attacking football that pegs the opposition into their half, while quickly circulating the ball, and maintaining a high defensive line – at Chelsea didn’t fit the players’ identity, nor did his eagerness to phase out the old guard bode well with management, the dressing room, or the supporters. Villas-Boas was sacked within seven months, and it appeared that his experiment in the Premier League was over. Nonetheless, Harry Redknapp’s dismissal at Spurs provided Villas-Boas the platform to prove his critics wrong, as the North London side pushed for Champions League football. This time, Villas-Boas completed the season with Spurs, guiding them to their highest Premier League point total, but they still finished a few points out of the top-four. Besides all the problems regarding the Portuguese manager and the Spurs hierarchy, the one issue Spurs encountered was scoring goals. Gareth Bale’s breakthrough season was pivotal towards Spurs’ success in his final season at White Hart Lane, but with the Welshman pushing for a move to Real Madrid, Spurs required another scoring outlet. A mixture of poor performances, lack of goals, and new signings needing time to gel played a factor in Villas-Boas’ dismissal, but turning against the fans, along with his naïve tactics that resulted in blowouts against Manchester City and Liverpool solidified his fate. The drive was no longer visible, the exuberant celebrations were halted, and his methodical approach was constrained – Villas-Boas wanted out. Spurs were at an all-time low, and the atmosphere around White Hart Lane became toxic. Yet two months later, the appointment of Tim Sherwood has proved to be successful, as Spurs sit a mere three points behind Liverpool for the final Champions League spot. Sherwood contradicts Villas-Boas’ style, as his team selections are pragmatic, his sides sit deeper without the ball, and Emmanuel Adebayor, opposed to Roberto Soldado, has led Spurs to success. 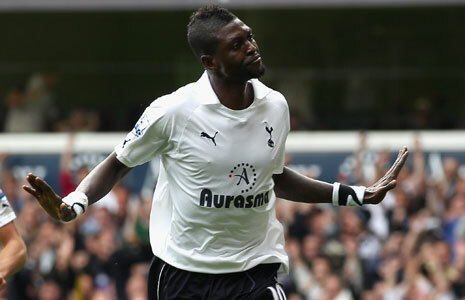 Villas-Boas attempted to sell Adebayor in the summer, but the striker was determined to stay put and fight for his position. 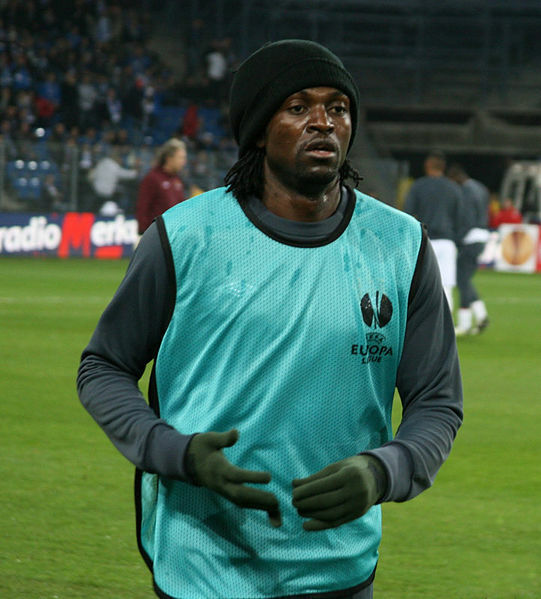 The Togolese striker’s poor relationship with Villas-Boas increased when he questioned the Portuguese manager’s tactics during training, thus resulting in his exclusion from the first-team. Adebayor’s behavioural issues have held him back in the past, but the Togolese striker doesn’t take his profession for granted, and is fortunate to play the sport he loves. The 29-year-old striker spent four years of his life unable to walk, in which his mother travelled across Africa with hopes of curing Adebayor. Adebayor spent most of his time in church during tribulation, due to his religious background – yet, despite numerous prayers, a footballing miracle changed Adebayor’s life forever. “I was in the church laying down and, around nine or ten o’clock on the Sunday morning, I could hear children playing outside. Suddenly somebody kicked a ball into the church. And the first person to stand up and run was me, because I wanted to get that ball,” Adebayor told the Telegraph. Adebayor’s opportunistic personality enables him to thrive when managers instill belief in the Togolese striker, but Spurs’ summer spending spree highlighted that the club was headed in another direction. Over £100m worth of talent arrived at White Hart Lane, including Spanish striker Roberto Soldado. On paper, the Spaniard represented a striker well suited for Villas-Boas’ system – a diminutive, mobile poacher that could punish the opposition if presented an opportunity around the 18-yard box. The 28-year-old striker plays on the shoulder of the last defender, constantly aiming to make darting runs in behind the opponents back-line in search of goals. Soldado’s £26m price tag merited him a start in Villas-Boas’ 4-2-3-1, but the Spaniard has only recorded five Premier League goals since his big move from Valencia – four from the penalty spot. Due to Villas-Boas’ lack of a no.10 capable of providing weighted through-balls, Soldado lacked the service to thrive at White Hart Lane. The 28-year-old spent most of his time under Villas-Boas isolated upfront, and with the Portuguese manager reluctant on playing 4-4-2, or using Emmanuel Adebayor, and Jermain Defoe, Spurs’ chances of achieving Champions League’s qualification was in jeopardy. Nevertheless, Adebayor’s return to prominence has been beneficial to Spurs, as the Togolese striker’s recorded nine goals since Sherwood’s appointment. Adebayor provides Spurs with a reference point, which not only adds variety to their attack, but also makes up their lack of a legitimate through-ball specialist when Christian Eriksen is unavailable. In Spurs’ victory over United at Old Trafford, Adebayor constantly dropped deep to link play, while Soldado stuck tight to the last defender, thus giving Spurs the attacking options they lacked under Villas-Boas. Adebayor received the ball in pockets of space and tormented Moyes’ back-line when he ran into United’s third. His opening goal signified the attacking dimension he offers Spurs – Adebayor linked play with Soldado in midfield, and ran towards the back post, out jumping Chris Smalling to perfectly nod Aaron Lennon’s cross past David De Gea. Sherwood believes that Adebayor’s experience and desire to play are vital towards Spurs’ success. “He is in the mood already, he wants to enjoy his football and I’m giving him license to go on the pitch and express himself,” Sherwood said. And even when Spurs haven’t played their best football under Sherwood, the Togolese striker has kept them within touching distance of fourth place as a lone striker. Everton single-handedly outplayed Spurs when they visited White Hart Lane a few weeks ago, but poor finishing and Adebayor’s wonderful strike ensured Spurs obtained maximum points. Despite being isolated for majority of the match, a lofted Kyle Walker free-kick saw Adebayor wonderfully control the ball, shrug off Seamus Coleman, and fire a venomous shot past Tim Howard. Perhaps, Sherwood still needs to incorporate a holding midfielder in his starting lineup, and find a way to limit the opposition from penetrating space between the lines, but his pragmatism states that he’s quickly learning from his mistakes. There’s always room for defensive improvement, though, but Adebayor’s goals can be the key towards Spurs’ Champions League return, opposed to another disappointing season. Liverpool produced a scintillating performance at White Hart Lane, which sees them climb to second in the table. Andre Villas-Boas made two changes to his side, introducing Roberto Soldado and Sandro to the starting line up. Brendan Rodgers was forced to make one change to the side that defeated West Ham last week, as Lucas was placed in midfield for the injured Steven Gerrard. Rodgers’ men were exceptional – they attacked and defended well as a unit, but most importantly they exposed Spurs’ highline. A key component heading into this fixture was how both sides would approach the match without the ball. In possession, they both rely on ball retention, yet defensively they intend on applying pressure, and closing down their opponents in their third. Spurs attempted to press Liverpool from the back with Soldado and Paulinho closing down the two centre backs, but Lucas Leiva dropped between Martin Skrtel and Mamadou Sakho as the spare man. 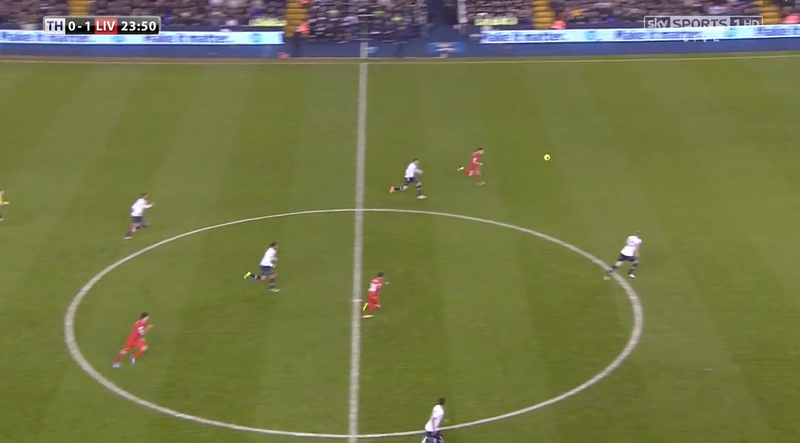 At times, Aaron Lennon and Moussa Dembele pushed forward to press Lucas, and a Liverpool fullback, but Nacer Chadli’s deep positioning provided Rodgers’ men with a passing outlet. The odd feat in AVB’s approach was their reluctance to press in midfield. Spurs maintained an extremely high-line, but they allowed Liverpool’s midfield space and time to play passes across the pitch. The only defence Villas-Boas could make is Liverpool’s aim to overload central areas – Rodgers’ men already had a numerical advantage in central areas, but with Phillippe Coutinho drifting infield, Spurs were outnumbered 4v2. A common feat in the first half was Liverpool’s aim to isolate Kyle Naughton. Prior to Liverpool’s opener, Rodgers’ men constantly looked to overload and play balls behind the Spurs left back. 10th min: Henderson played a lovely diagonal ball to Raheem Sterling, and the Liverpool winger cut to his right, beating Naughton, and forcing him to foul Sterling at the edge of the 18-yard box. 11th min: Sterling intercepts Dembele’s pass and plays a one-two with Coutinho, before slipping a ball to Allen – behind Naughton – who delivers a cross into the box, thus leading to Sterling firing his shot over the net. 15th min: Etienne Capoue fails to clear Lucas’ corner, and the ball falls to Sterling, who cuts to his right, beats the Frenchman for space and drives a venomous cross into the box. 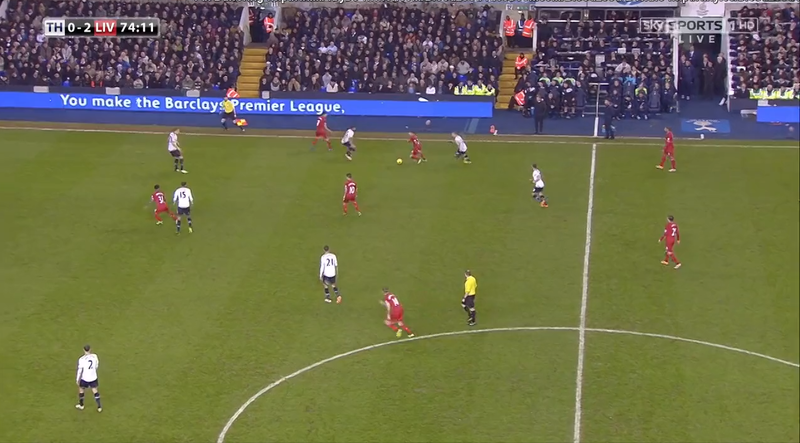 17th min: Coutinho drifted infield, dragging Chadli and Lennon out of position, before slipping a ball into Sterling. Chadli recovered his run, but was also beaten for pace by Sterling, but the Liverpool winger’s cross went right into Hugo Lloris’ hands. 47th min: Sterling got the better of Lewis Holtby by cutting towards the byline, and his lofted cross was met by Sakho, who nodded the ball off the post. Sterling was Liverpool’s main threat leading up to Suarez’s opening goal – Rodgers utilized his pace, and instructed his men to play him into 1v1 situations. Naughton struggled throughout the entire half, and Ezekiel Fryers replaced him at half time. Subsequently, Liverpool took the lead a minute after Sterling’s final threat in the opening 20 minutes. There’s no denying the quality of the finish, or Henderson’s influence on the situation, but the manner in which Spurs conceded was appalling. Above we see Spurs’ shape after Dawson’s timely sliding interception to prevent Henderson from breaking free on goal. We also see Suarez behind Dembele, Sandro and Capoue. Henderson’s persistence allowed him to nick the ball away from Dawson to play in Suarez, and the Uruguayan – who was initially behind the three Spurs players – ran onto the ball, anticipated Walker’s slide, swayed to the left and coolly slotted his shot past Lloris. While Henderson’s run and determination plays a pivotal role towards the build-up of the goal, the work ethic and positional awareness of the Spurs trio was diabolical. The most evident feat throughout the match was Spurs’ vulnerability maintaining an organized high-line, and Liverpool’s aim to get runners behind it. It also didn’t help that Villas-Boas was without Jan Vertonghen and Vlad Chiriches, thus forcing him to pair Capoue and Dawson against Suarez. However, it was peculiar to see AVB stick with this approach, considering his results against both Manchester clubs this season. At the Ethiad, City blitzed Spurs’ backline, defeating them by six goals. Yet, against United, Spurs sat a few yards deeper and focused on minimizing passing lanes, and space between the lines. Here, they reverted to the approach at the Ethiad, which ultimately made Rodger’s approach straightforward. 21st min: Sterling and Joe Allen dispossessed Chadli at the halfway line, and Sterling drove forward and played Suarez through, but the Uruguayan failed to slip his shot past Lloris. 23rd min: A simple Lucas long ball stretched Spurs’ backline and set Coutinho free on the left flank. 27th min: Lucas played a quick pass to Coutinho off a free kick, and the Brazilian spotted Suarez’s simple run into half-space. Suarez did well to hold the ball up, and cut it back to Coutinho, and his shot rattled the cross bar. 33rd min: A simple hoofed clearance from Martin Skrtel, sees Suarez run past the Spurs high-line and nearly double Liverpool’s lead. Lloris mistimed his header, and it fell to Suarez, but the French keeper did well to recover and deny the Uruguayan. Villas-Boas’ approach was eccentric – he instructed his men to play a high-line, but no pressure was applied on the midfield, and Liverpool were allowed to easily bypass the Spurs midfield. Meanwhile, it was beneficial to Suarez, who is renowned for making runs into the channels and behind the backline. This was a poor tactical approach from AVB, yet this isn’t the first time his preferred high-line has failed him in a big match. Although Suarez may steal all the headlines based on his great form, and outstanding goal return, it’s key to note that Henderson was magnificent at White Hart Lane. At times, Henderson found himself in deeper positions playing long diagonals and retaining possession, but Spurs were unable to cope with his dynamism from midfield. 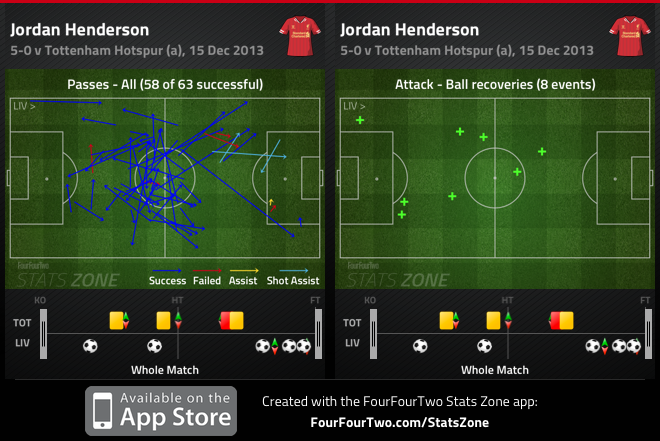 Henderson’s energetic runs from deep positions were integral to the buildup for three Liverpool goals. Rodgers was aware of Villas-Boas tactical naivety, and he encouraged the Liverpool midfielder to push forward and attack open space. 17th min: Henderson attacked space between Walker and Dawson, which gave Suarez a positive passing option. Dawson may have intercepted the pass, but Henderson’s run and persistence handed him the opportunity to lay the ball off for Suarez, thus leading to his opener. 39th min: Henderson starts his run at half between Lennon and Paulinho, and the Liverpool midfielder surges forward unmarked, and runs into space to receives Coutinho’s lay off. Lloris stopped Henderson and Suarez’s efforts, but the Englishman did well to convert the third attempt. 74th min: Henderson makes a run behind Chadli and into the space between Capoue and Walker. Walker does well to force Henderson wide, but he provides a nifty back heel to Suarez, who picks out Jon Flanagan at the back post, and he fires his shot off the cross bar to give Liverpool a 3-0 lead. Henderson’s role was pivotal to Liverpool’s success at White Hart Lane. He was a proficient distributor from deep positions – alongside Allen he pressed Dembele, Sandro and Paulinho out of the match, and his energetic runs from midfield tormented the Spurs backline. Spurs responded well in the second half as Liverpool oddly dropped deeper into their third, but Soldado missed two opportunities to cut down the two-goal deficit. While Spurs pushed forward, Liverpool had clear opportunities to expose Villas-Boas’ men on the counter – led by Henderson – but they often lacked the final ball. Ultimately, Paulinho’s red card midway through the second half ended any chance of Spurs mounting a comeback. With Sandro’s injury in the first half, Dembele’s departure for Andros Townsend and Paulinho’s sending off, AVB was forced to field Lewis Holtby and Chadli in a 4-4-1. 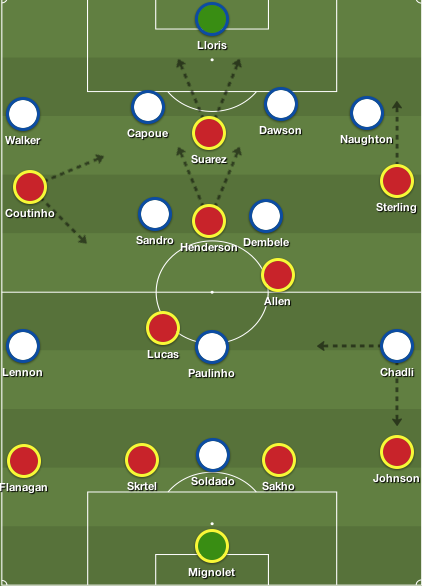 Liverpool received more space in midfield to retain possession, and Rodgers’ men surprisingly only scored three goals, despite creating numerous opportunities. This was a fantastic Liverpool performance, but it’s difficult to ignore Villas-Boas’ tactical naivety. The Portuguese manager looked to have learned from his mistakes based on his approach against United, but is eagerness to revert to back to his preferred philosophy has been suicidal. It let AVB down in big games throughout his career in England, and this time it cost him his job at White Hart Lane. Rodgers’ men were diligent out of possession, and isolated Spurs’ deficiencies at every opportunity. Liverpool targeted Naughton, nullified their holding midfielders, and used an energetic midfielder to penetrate open space. The result will build confidence in the Liverpool dressing room, but it’s unlikely that they’ll enjoy such freedom on their trips to City and Chelsea – until then, it’s difficult to categorize Liverpool’s role in the title race. Arsene Wenger was a calm figure in his pre-match press conference Friday afternoon. Arsenal was in their darkest hour since their opening day defeat to Aston Villa, as they lost consecutive home matches to Borussia Dortmund and Chelsea in cup competitions. 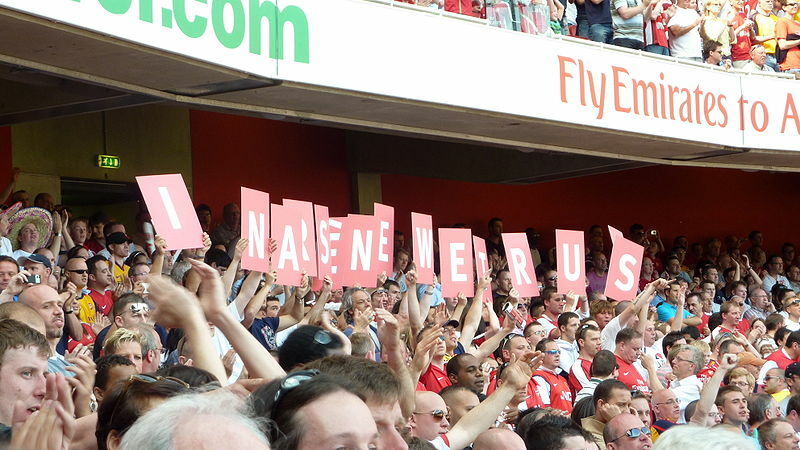 However, the Arsenal manager didn’t show a sign of fear. He was confident his men would show up to the occasion. And a big occasion it was. Although Arsenal hasn’t encountered stern opposition yet, they hosted a Liverpool side in hot form. Liverpool’s success has been down to Luis Suarez and Daniel Sturridge’s great run of form, and Arsenal’s main goal was to keep them quiet. While there aren’t many people buying into Arsenal’s great start this season, Wenger is confident that his men will prove the doubters wrong. He’s developed an ‘us against the world mentality’ within his squad that’s proved to be quite successful thus far. The media’s doubt in Arsenal’s title credentials has been Wenger’s fuel to motivate his men, and once again they produced a scintillating performance. The Gunners’ superiority in midfield proved to be pivotal, as they aimed to get runners from midfield to attack space and latch onto the final ball. Their attacking midfielders dropped deeper to sustain possession, Aaron Ramsey continued to impress on both ends and Bacary Sagna is proving to be a sensible outlet on the right flank. Similar to Olivier Giroud’s goal against Borussia Dortmund, Sagna got into an advanced position down the right flank, and delivered a wonderful cross towards Santi Cazorla – aided by Giroud’s movement, which dragged Kolo Toure and Martin Skrtel out of position. Cazorla nodded the ball off the post, but quickly reacted and smashed the rebound into an open net. From an attacking sense Sagna’s role can become prominent with Arsenal fielding a narrow midfield, depending on his ability to consistently deliver quality balls from the right flank. Liverpool did present Wenger’s men with a few scares, mainly through their direct play on the break between Sturridge and Suarez. In the early moments of the match, both men dropped deep to receive the ball and got past Mikel Arteta on a few occasions. But as the match progressed, Laurent Koscielny mirrored Arteta’s defensive responsibilities – as it was evident he needed assistance – and stayed tight on the forward that dropped deep. 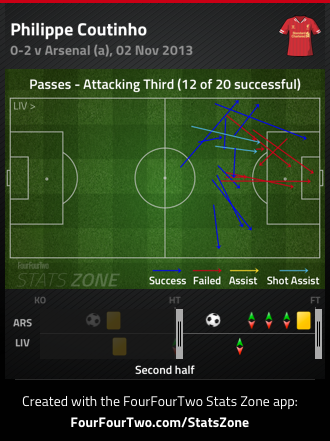 Ultimately this hampered Liverpool’s attack, as they lacked invention when Arsenal had players behind the ball. Brendan Rodgers’ men were stifled when trying to play out of the back as Arsenal pressed higher up the pitch, winning possession in Liverpool’s third. Liverpool could have benefitted from pushing higher up the pitch as a unit, and getting their wingbacks forward, but they preferred to do neither, despite Jon Flanagan getting into decent positions. Rodgers attempted to turn the tide in the second half, by reverting to a 4-4-2 and introducing Philippe Coutinho on the left. Although Coutinho looked a bit off pace – considering he returned from injury – Liverpool maintained a better shape without the ball. Coutinho’s impact on the match was less eventful from an attacking perspective – the Brazilian’s movement was positive, but he was unable to complete his precise passing in the final third. Ramsey put the match out of reach when he received a clever pass from Ozil at the edge of the 18-yard box. The Welshman let the ball bounce and confidently struck it on the half volley past Simon Mignolet. Liverpool failed to impress on their first legitimate test of the season, while Arsenal continued to focus on their superiority in midfield. Arsenal’s fluid, canny, relentless and patient, yet when you add in the improvement of Giroud’s overall game and their manageable schedule thus far, you can understand why the Gunners are top of the table. Regardless of what their defensive statistic’s state, Wenger’s men still look vulnerable at the back, and it’ll be interesting to see how they develop in the latter months of the season. Nonetheless, this result should boost Arsenal’s confidence ahead of a week that sees them travel to Dortmund and Manchester United. The Gunners have been imperious thus far, but we’ll get a better sense of their overall strengths next week. Chelsea missed an opportunity to go top of the table for a few hours, as they fell to Newcastle at St. James Park. Jose Mourinho’s men struggled to move forward a unit in the opening minutes, due to Newcastle’s early pressure. 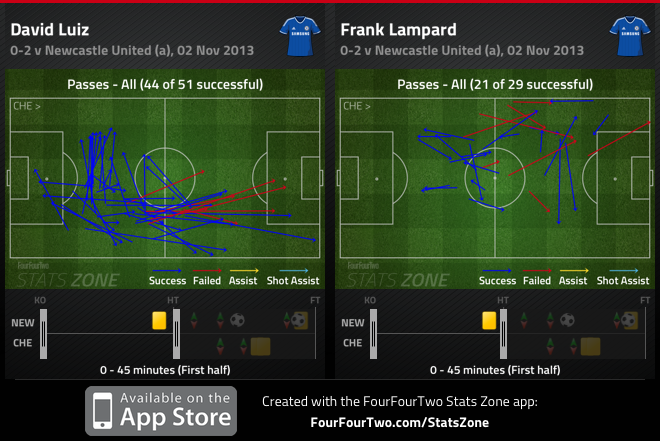 Chelsea’s fullbacks were quickly closed down, while Frank Lampard and Ramires were also unable to push forward. Lampard’s inclusion in away matches or against top class sides is quite bizarre considering his limited impact on the match. Due to Lampard’s inability to play penetrating forward passes, David Luiz proved to be a vital cog in Chelsea’s attack, as he played balls between the lines for Oscar and Juan Mata to receive. Newcastle was complacent in the first half, and despite Chelsea’s dominance in possession, the Blues were dull in the final third. The onus was on Mourinho to make changes in the second half, to give his side a slight advantage. However, it was Pardew who made the most of the personnel on his bench. Vurnon Anita was superb upon his arrival, allowing Yohan Cabaye to push forward, and the movement of Loic Remy improved massively in the second half. Remy dropped deeper to help Newcastle push forward – a feat neither striker completed in the first half – while Yoan Gouffran and Moussa Sissoko were threatening on the counter, as Chelsea pushed more men forward. Coincidentally, it was Gouffran who was on the receiving end of a wonderful Cabaye delivery, which gave Pardew’s men the lead. Samuel Eto’o, Willian and Andre Schurrle were introduced in the second half, as Chelsea gradually improved, but their passing tempo was still slow and penetration was at a minimum. Loic Remy put the match out of reach for the Blues as they fail to end their week on a high note. Chelsea missed a great opportunity to keep pace with Arsenal at the top of the table, and they now sit five points behind the league leaders. Manchester United won their fourth consecutive match in all competitions, as they easily dispatched of a poor Fulham side. United scored three goals in the opening 30 minutes to earn three valuable points ahead of a monumental showdown against league leaders Arsenal next week. Fulham’s overall shape without the ball was shambolic, as Wayne Rooney and Robin Van Persie found it relatively easy to receive the ball between the lines. United’s notorious strike force tormented Fulham’s makeshift centre back duo, as they played a key role in all three United goals. The Red Devils were in full control of the opening 45 minutes – Phil Jones was given time and space to dictate the midfield, whereas Fulham was dismal in central areas. There was a vast improvement in Fulham’s second half performance as United were content with the result. They now await a trip to Spain midweek, and host Arsenal at Old Trafford, in a match that can truly define their season. Moyes’ men can’t afford to lose another match at home, especially when it can put them 11 points behind Arsenal. Tottenham and Everton wasted the opportunity to climb to second in the table as they played to a dire draw at Goodison Park. Andre Villas-Boas’ men were dominant in the first half pressing Everton and preventing them from playing out of the back. 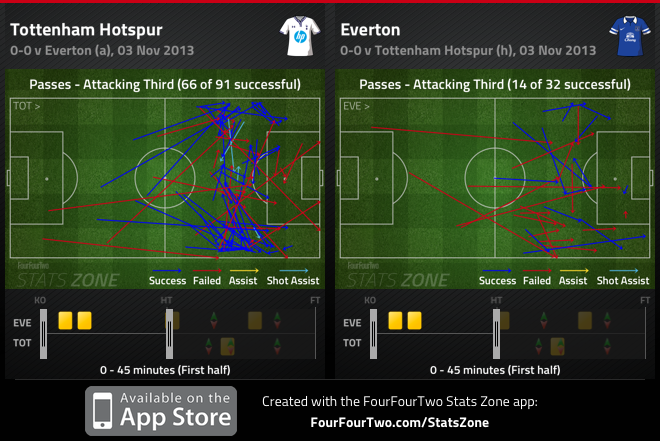 Aaron Lennon, Jan Vertonghen and Andros Townsend were rampant down the flanks causing the Everton fullbacks nightmares. Villas-Boas’ men struggled to play out of the back in the early periods of the match, but relied on Michael Dawson’s cross-field diagonal balls to push the North London side forward. 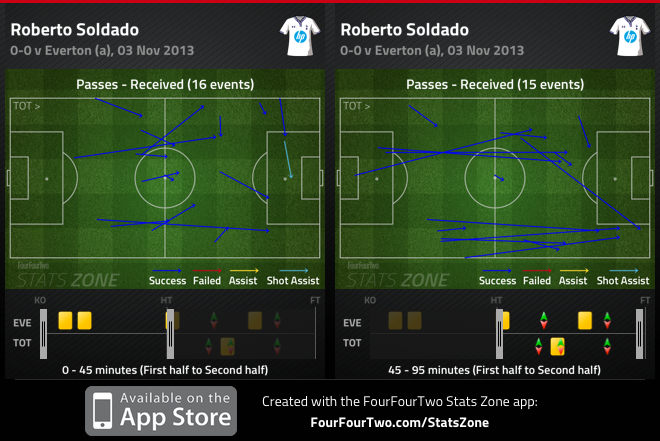 Yet, despite Spurs’ superiority in possession, Spurs didn’t provide Roberto Soldado with quality service. Nevertheless, the Spaniard was poor on the night, failing to connect with his teammates when the opportunity was presented, and his touches were dismal. Everton improved in the second half when Gerard Deulofeu and Ross Barkley sparked energy in Everton’s attack – with Barkley’s movement between the lines and Deulofeu’s pace. 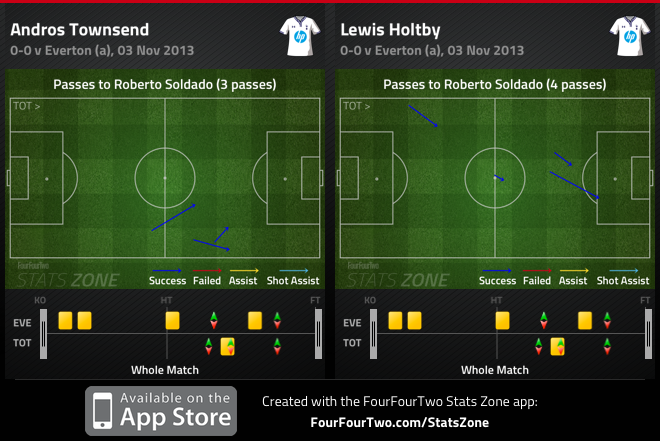 Despite Holtby’s positive outing in the no.10 role – pressing the opposition and playing positive passes – the German midfielder, like the wide men, failed to connect with Soldado, which has been Spurs’ major issue this season. While Spurs continue to be impressive on the defensive end, their inability to score goals is worrying. Soldado is top-class striker, but he needs service and players to work off of, hence why Christian Eriksen’s arrival was pivotal. He’s the only player in the Spurs side capable of playing incisive passes in the final third, and if runners aren’t getting behind Soldado, his ability to play defence-splitting passes will be significant towards Spurs’ and Soldado’s success. Joe Hart was dropped from the Manchester City starting XI, thus handing Costel Pantilimon a spot in the City lineup. The Romanian goalkeeper didn’t have much work to do, as six different City players got on the score sheet in their impressive 7-0 victory over Norwich. Steven Caulker’s second half header earned Cardiff City three points in the Premier League’s first Welsh Derby. It was a cagey affair that saw both sides nullify their opponent’s strengths in midfield. The main source of attack came from long diagonals behind the left back – it led to openings for Swansea in the first half, and the corner that led to Caulker’s goal in the second. Cardiff City manager Malky Mackay stated pre-match that his men had to get it right tactically to earn three points, and that’s what they did. Cardiff City v Swansea City was the first ever top-flight fixture in England not to feature any English teams. Spurs have only conceded one league goal in the first half of Premier League games this season, fewer than any other team. Asmir Begovic’s goal 13 seconds into Stoke City’s match against Southampton makes him the FIFTH goalkeeper to score a Premier League goal and the previous fastest was in the 62nd minute. Manchester United’s total of 14 points after nine matches is seven points less than they had at this point last season. José Mourinho suffers his worst Premier League defeat as Chelsea manager since a 2-0 defeat at Aston Villa in September 2007. Arsenal has lost 28 Premier League matches in the month of November, more than in any other month. Under Wenger, have lost 22 of 67 in November (33%). Infostrada Sports (@InfostradaLive) provides all the stats in this recap. Tune into the 2 Guys and a MIKE podcast as it returns this week. Subscribe to it on I-Tunes! Gareth Bale is encountering an arduous situation at the Santiago Bernabeu. It’s been two months since Bale made the move to Real Madrid, and the Welshman has been vilified and harshly scrutinized by the Spanish media. The rapid influx in fans, owners and the media demanding immediate success has somewhat tarnished modern day football, as players and manager’s are continuously under severe pressure. Despite all the negativity surrounding Bale, it’s shocking to know that he was a household favourite a few months ago. Tottenham Hotspur supporters were on the edge of their seats when Bale received the ball on the right flank in their final game of the season against Sunderland. Had it been a few years ago, he may have opted to pass the ball or attempt a pacy dash towards the byline to provide a cross – but not this time. His confidence was oozing off his sweaty skin and fear was expressed in the Adam Mitchell’s eyes, as there was only one logical outcome. The 24-year-old Welshman cut infield with his fancied left foot and curled the ball with precision and pace, humbling Simon Mignolet as could do nothing but watch the ball fly into the top corner, despite his efforts to make a save. White Hart Lane erupted. Spurs faithful adapted to Bale’s brilliance throughout the season, and this was just another piece of magic to add to the highlight reel. Bale ran towards the Spurs supporters jubilant, knowing that this would be the last time he’d share a moment of this magnitude at White Hart Lane. The celebration was more of a ‘come get me NOW’ opposed to a sign of hope that relied on their London rivals dropping points on the final day of the season to solidify fourth place. Daniel Levy’s most prized asset was ready to make the big jump abroad, despite the North London side earning a club-high 72 points. Truthfully, it was foreseeable. Bale’s vast growth into a world-class player couldn’t be ignored. He thrived in a no.10 position under Andre Villas-Boas that handed the Welshman a free role to roam around the final third searching for gaps and openings in the opposition’s backline. However, he maintained defensive responsibility by quickly closing down centre backs to complement Spurs’ high-pressing game. The pressure of living up to the ‘galactico’ billing is insurmountable. However, Bale – the 11th galactico – had bigger shoes to fill as his summer transfer to Real Madrid made him the world’s most expensive player. Nonetheless, it’s interesting to know that on two separate occasions, Bale’s career hung by a thread. Bale’s athleticism was evident at a young age. The Welshman excelled in rugby, hockey and track-field throughout school, but football was Bale’s top priority. The Welshman’s PE teacher Gwyn Morris was aware of the Welshman’s talent and challenged him to improve other aspects of his game by forcing Bale to play one-touch football and predominantly use his weaker right foot, as he was superior to the rest of his schoolmates. Southampton youth scout Rod Ruddick spotted the Welshman when he played for Cardiff Civil Service in a U-9 five-a-side tournament in Newport, Wales. “Even at the age of eight Gareth had fantastic ability. When you sign a player at that age it is because they have great potential and he has just kept getting better,” Ruddick said. “You could see his pace and quality on the training pitch but I think his left foot helped him stand out. What we saw then we knew he was going to be something special,” he added. Bale worked his way through Southampton’s satellite academy, but his recurring back injuries sustained from a growth spurt, nearly prevented him from receiving a full-time scholarship. 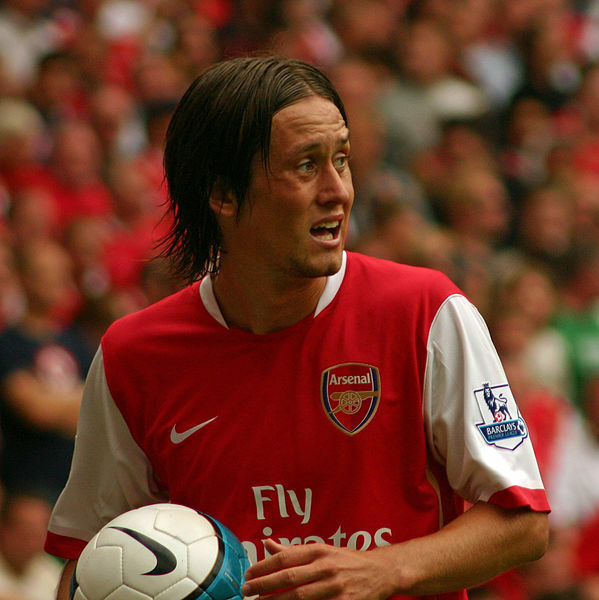 The Welshman signed with Spurs for £10m in 2007 – a year after breaking into the Southampton first team – and he endured 24 consecutive losses when he featured for the North London club. Bale’s frail build was his downfall, as he struggled to stay fit, which saw Alex McLeish attempt to pursue to the Welshman to join Birmingham in 2009. “Gareth wasn’t in the Spurs side at the time and Harry Redknapp wasn’t able to get him a game for whatever reason,” McCleish said. Bale worked hard over the next few years to become stronger physically and mentally – with help from former Spurs manager Harry Redknapp’s tough love approach in training – and the football world witnessed glimpses of his brilliance. He took the world by storm through his two performances against Inter Milan in 2010, where he singlehandedly terrorized Brazilian fullback Maicon. Bale’s ability was never questioned – it was whether he could replicate his performances on a consistent basis. Under Andre Villas-Boas, the 24-year-old winger flourished, and took the first chance to move abroad to challenge for trophies, opposed to spending another year at White Hart Lane, fighting to secure a Champions League spot. It was his childhood dream to play for Madrid, but scrutiny and ridicule followed him like a shadow. 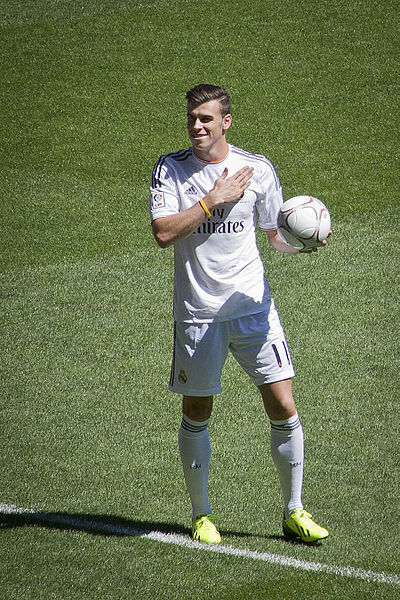 More so, Bale’s transfer fee has been the focal point during his sluggish start at the Santiago Bernabeu. Had Bale set the valuation, or publicly stated he was worth £85m, then it would be understandable – however he didn’t. The inflated transfer market has been beneficial to teams with lesser financial power, as they now possess the power to hold out until they receive their required price tag. Is Bale a £85m player? No. At the time, was Bale worth £85m? Possibly. Considering his remarkable performances throughout 2012/2013, the three years remaining on his contract, and the fact that Spurs initially weren’t willing to sell the Welshman, the valuation isn’t far-fetched. Consequently, the Bale saga, and a few niggling injuries, prevented the Welshman from participating in pre-season activities. Given the circumstances, it’s absurd to label the Welshman a ‘flop’ based on the first two months of the season. Adapting to a new league, culture, country and style of football is never easy. While some players settle quickly into a new environment, others need time and patience – and based on the abundance of turnover that transpired at Madrid this summer, it’s rational. Carlo Ancelotti, known for his possession-based philosophy has struggled to find his best starting eleven, and has been adamant on fitting Bale into the equation. But the rise of Angel Di Maria – arguably Madrid’s best player this season – has highlighted the need of natural balance in Ancelotti’s attack, specifically in their 7-3 victory against Sevilla. “The team lacks little offensively, but lost concentration when at 3-0, but then continued to play well. We need more balance because you cannot open up a game when you are winning 3-0,” Ancelotti said. “We played faster and more vertical. We need more offensive balance, but the game was fantastic,” he said. Bale displayed glimpses of old, grabbing two goals and two assists. Sevilla’s shape without the ball was diabolical for large portions of the match, which benefitted a Madrid side that prefers to attack on the break. The Welshman was allowed space to isolate defenders, use his blistering space to stretch the match by running towards the byline, make darting runs into the box and combine with his teammates in wide areas. Likewise, Bale has struggled to impose his authority on matches against sides that prefer to sit deeper, and defend with nine men behind the ball. Opposed to England, La Liga sides are precise with their overall shape without the ball, as they aim to be organized and compact. With Cristiano Ronaldo playing a free role, Bale has less space to work with, is more likely to drift out of games via isolation, and is a conventional winger, which will explain his inevitable statistical decline. Coincidentally, Bale and Madrid, are going through a transitional period. Ancelotti is searching for balance, a preferred formation and a cohesive unit – whereas, Bale is settling into life abroad, which will expect him to thrive with less space, in a natural wide role. An £85m transfer fee guarantees high expectations, but if Madrid supporters and owners are patient, then Bale can prove to be an intelligent investment in the near future. They came, they saw, but they didn’t conquer. Well, for a Southampton side that flirted with relegation last season, a draw at Old Trafford would suffice. However, like last season, Mauricio Pochettino’s men may feel as if they underachieved. Meanwhile, the pressure on David Moyes is at an all-time high, as the Red Devils are off to their worst start to a season in the Premier League era. Unlike last season, neither Robin Van Persie, nor Wayne Rooney could save Manchester United from mediocrity. Outscoring their opponents is no longer a genius tactic – their production in the final third is anonymous, the clinical finishing is a distant memory, while long-periods of possession was a rarity. Although United didn’t play well, they had a few chances to put the match out of reach, but Artur Boruc and the crossbar denied Moyes’ men three points. Southampton – who’s improved significantly compared to last season – produced an impressive away performance combining excellent work-rate and movement between the lines. Morgan Schneiderlin stepped forward to press Marouane Fellaini, whereas Steven Davis and Victor Wanyama kept tabs on Michael Carrick – and Wayne Rooney when he dropped deeper. Most teams don’t possess the pluck to press Carrick when he receives the ball, but if executed properly, it limits Carrick’s contribution to United’s attack. Meanwhile, Fellaini’s transfer still seems peculiar and superfluous, as his performances have been mediocre. The Belgian is sitting deep alongside Carrick, offering the same threat as his midfield partner – besides the penetrating passes between the lines – which prevents him from joining the attack. With both midfielders nullified, and adequate pressure applied on the defenders, United struggled to dictate the tempo of the match. Schneiderlin continued to drive forward when possible, while Lallana and Davis roamed around the final third when in possession. In particular, Lallana drifted infield looking to play incisive passes in the final third, while Davis dropped deeper to help Southampton sustain possession and drive forward as a unit. Frankly, United were struggling to cope, and Pochettino knew his side was capable of earning a point at minimum. While, James Ward-Prowse, Rickie Lambert and Guly Do Prado were introduced to increase their attacking impetus, Moyes decided to preserve the lead by adding numbers in midfield and the backline, which was logical. Regardless of the late Dejan Lovren equalizer, United couldn’t solve Boruc, and they didn’t assert their dominance on the match. “I am disappointed because we wanted to get a bit of momentum going and we weren’t able to do that,” Moyes said. Southampton produced an impressive away performance – one similar to the win at Anfield, and had Osvaldo been up for it, they might’ve walked away with all three points. Nevertheless, it’s impossible for Moyes to avoid the critics after dropping points at home. Carrick, arguably United’s best player last season, was quick to highlight that luck hasn’t been on United side thus far. “It is frustrating because things are not going the way we want. But as players we have to stand up, take responsibility and get better,” Carrick said. “We are still confident. Everything is in place but for some reason, at the moment, we are not quite clicking and not quite firing,” he added. The most concerning issue is United’s shape overall – the double-pivot sits too deep, while the three attacking players behind Van Persie have struggled to create legitimate goal-scoring opportunities. Adnan Janzuaj has been a refreshing inclusion to the squad, yet heavily relying on an 18-year-old winger is an indictment on the squad, opposed to the player. If Saturday’s draw was any indicator to how the season will pan out, United will struggle to defeat the better Premier League teams this season. 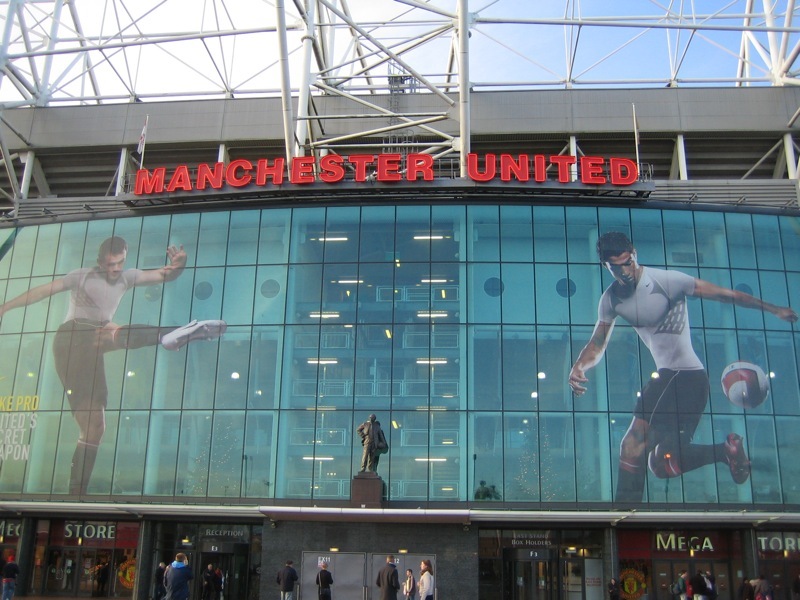 More so, majority of United’s title rivals, and mid-table Premier League sides have evolved over the transfer window, whereas United hasn’t, and Van Persie’s goals may not be enough to retain their Premier League crown. Arsenal remains two points clear at the top of the Barclays Premier League, defeating Norwich City 4-1. A recurring theme in their play since Ozil’s arrival has been the urge to overload central areas. Likewise, with the inclusion of Jack Wilshere, Mesut Ozil and Santi Cazorla behind Olivier Giroud, Norwich had no answer for Arsenal’s movement in the final third. 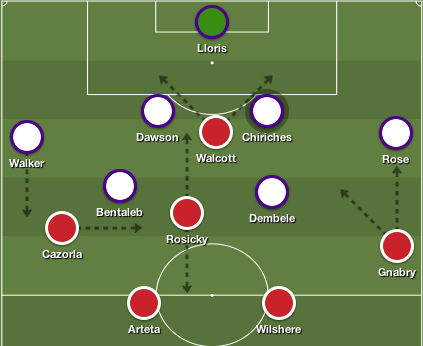 While Norwich pressed Mikel Arteta and Mathieu Flamini, the movement of the front three always provided Wenger’s men with passing options, along with handing Wilshere the license to push forward – as runners got behind Giroud who dropped deeper to link play and provide wonderful assists for Ozil and Wilshere. Despite Norwich handing Arsene Wenger’s men a few scares, their quality in the final third was disappointing. 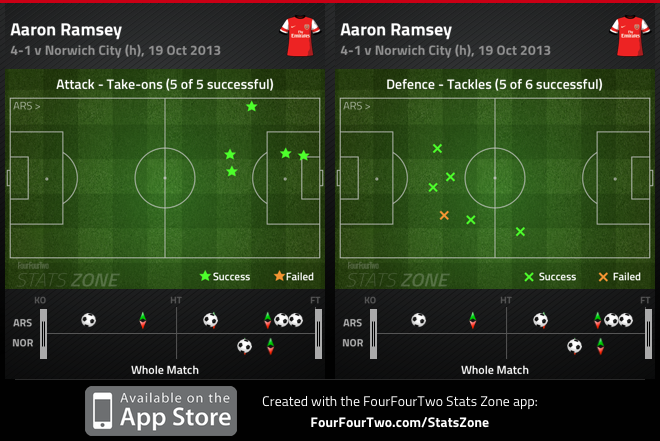 Aaron Ramsey – who started the match on the bench – came on for the injured Flamini and continued to impress. He made key tackles, scored a wonderful goal, and assisted Arsenal’s fourth goal, as the Gunners continue to shine. Stamford Bridge was filled with controversy, as Eden Hazard’s equalizer should’ve been disallowed. Samuel Eto’o nicked the ball away from Cardiff goalkeeper Dave Marshall when he bounced it on the ground, which subsequently led to Hazard sliding the ball into the net from close range. According to FIFA rules, the goalie is still in possession of the ball when he bounces it, meaning Eto’o committed a foul that the referee missed. However, Cardiff dropped deep into their third and frustrated Chelsea to the point where Mourinho gambled and played three at the back – thus leading to a quality strike from Eto’o. Along with an entertaining Jose Mourinho dismissal, Cardiff caused Chelsea a few problems in the final 20 minutes, but Oscar and Hazard increased the lead, pushing the Blues to second in the table. Manuel Pellegrini saw his men earn their first away win of the season at Upton Park, orchestrated by David Silva and Sergio Aguero. Aguero produced two fine finishes to give City a comfortable lead, and assisted Silva’s goal late in the second half. But the main man was Silva, he floated across the final third finding pockets of space to link play and build attacks, as he thoroughly controlled the match. Sam Allardyce attempted to replicate a shape that saw his side defeat Spurs at White Hart Lane, but his men left too many gaps of space around the final third for City attackers to drift into, and were blitzed for large portions of the match. Another away test awaits Manchester City next Sunday, as they travel to Stamford Bridge full of confidence, aiming to overtake Jose Mourinho’s Chelsea. Andros Townsend stole the headlines once again, as he was one of the few bright spots in Spurs’ victory at Villa Park. Villa maintained a high defensive- line in the first half, and focused on pressing Spurs’ fullbacks and two holding midfielders. Andre Villas-Boas’ men were unable to break through the press, as Villa’s fullbacks tightly marked their wingers and Roberto Soldado was isolated upfront. But Paul Lambert tinkered with his side at half-time – seeing as Townsend was fortunate to see his cross beat Brad Guzan to give Spurs the lead. The reason behind switching to a 4-3-1-2 was to get the most out of his attackers – who also didn’t see enough of the ball in the first half – but pushing them into central positions left the Villa fullbacks vulnerable against overloads. Townsend was at his very best after the change, driving down the right flank and his unpredictability left Antonio Luna confused, as he was unsure whether Townsend would cut in or attack the byline to produce a devastating ball into the box. Christian Benteke did enter the fray in the second half, giving Villa a lift with his aerial presence that Libor Kozak lacks – despite his height – but Soldado’s goal minutes later was the final blow for Lambert’s men. Daniel Sturridge scored his 7th goal of the season to nick a point against 10-man Newcastle. It was mediocre display from Brendan Rodgers’ men, who allowed Cheick Tiote and Yohan Cabaye to dictate the match – and witness the French midfielder score a great goal. Prior to Mapou Yanga-Mbiwa’s sending off – for pulling Suarez in the box, thus leading to a Gerrard spot-kick – Suarez and Sturridge were deprived service, as they were forced to drop deeper to get involved with the play. Nevertheless, tactical alterations were significant, as Alan Pardew encouraged his men to drop into a 4-4-1, sacrificing Moussa Sissoko for Paul Dummett, who gave Newcastle the lead in the second half. However, Liverpool switched to a 4-2-3-1 introducing Luis Alberto, who was instructed to drift infield, allowing Glen Johnson to push forward. The change gave Suarez more space to operate in, as he drifted into the channels and between the lines, and it reaped rewards as he assisted Sturridge’s equalizer. Liverpool searched for a winner by introducing Raheem Sterling and pushing Alberto in an advanced position in midfield, but Tim Krul made a few top saves in the latter stages of the match to earn his side a valuable point. Manchester United fail to win successive Premier League home matches for first time since 2007. 16 points from seven ‪Premier League matches, is the most points that Arsenal have had at this stage of the season since 2007/08. Daniel Sturridge has scored in six consecutive Premier League away matches. Only one player in ‪Premier League history has more – Robin Van Persie in nine. Liverpool is undefeated in their last 8 Premier League away matches for the first time since Apr–Oct 2008. Robin van Persie needs 1 more goal to reach 127 in the Premier League. Would make him equal Hasselbaink’s Dutch record and join him in 10th all-time. Steven Gerrard has scored his 100th ‪Premier League goal in his 449th appearance.